Baume & Mercier Petite Promesse: “Chic à Porter”! A watch in a mini format like a link to those you love. This is Petite Promesse, by Baume & Mercier. Daring, feminine and sparkling with color, Petite Promesse is about pleasure and sharing, reflecting the delights of everyday life. Petite Promesse comes in a mini format that creates timeless feminine appeal, with a diameter of 22 mm. The bezel is set with sparkling diamonds, and the watch itself is designed with perfectly balanced proportions: the interplay of oval and round between case and bezel infuses the timepiece with harmony. A contemporary form that echoes the elegance and formal freedom of the 1970s model, which was born exactly from the idea of incorporating an oval inside a round shape. A wrap around leather strap or steel bracelet is the perfect complement to the case shape, turning time into a concentric vision and making Petite Promesse very light and comfortable to wear. The grace of this unique interlinking transforms the watch into a true piece of jewellery. 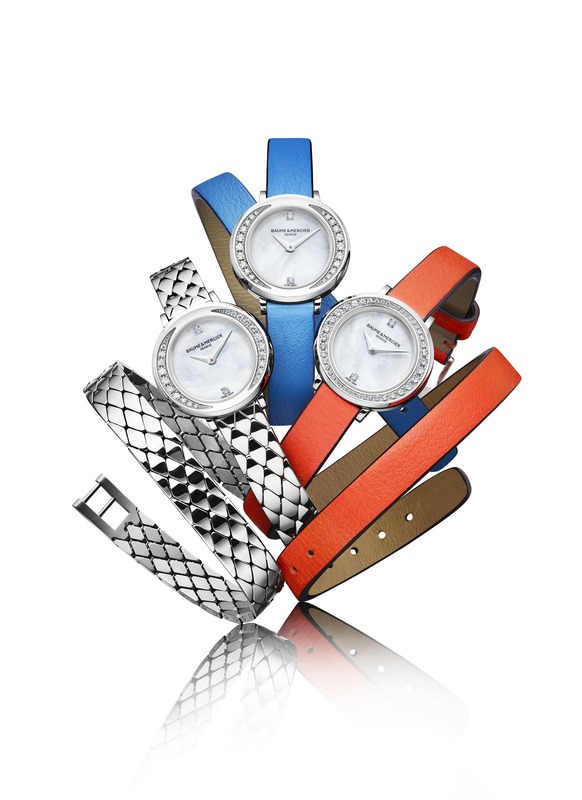 Its characterful signature is expressed in three versions: steel, bright blue leather and vivid orange leather. A model fitted with a blue strap – bright, deep and modern. The wrap around strap and its calfskin with contemporary finishing give this polished steel watch, partially set with diamonds, a very trendy contrast of chic and glamor – all the makings of a genuine style accessory. A wrap around calfskin strap in bright, spicy orange brings optimism and a bright mood to this glamorous model with an oval case entirely set with diamonds. A precious model that adorns the wrist of glittering celebrities. It boldly combines leather in an ultra-modern color with contemporary finishes and the ageless chic of a superb diamond setting. Grace and audacity, interpreted by a unique double wrap-around metal bracelet of watchmaking manufacture whose brilliance echoes that of the bezel partially set with diamonds. This model plays with the design codes of the small Baume & Mercier wristwatches created in the 1920s and considered as pieces of jewellery. Their air of elegance, femininity and celebration is revisited here with an original and unexpected contemporary twist. Three watches, each with a strong personality to choose according to your character and mood. With a dial in perfectly pure white mother-of-pearl, with two diamonds as indexes at 6 and 12 o’clock, Petite Promesse houses a Swiss-made quartz movement selected for its precision and mini size.